My new favourite is the Buffalo Chicken pizza. Plenty of chicken and buffalo sauce all over this one. The sauce even has a little kick to it. Their garlic knots are seriously not to be missed. 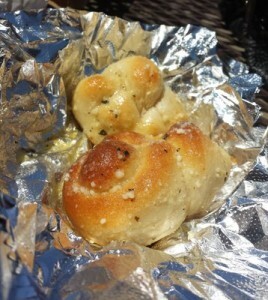 It is hands down the best garlic knot I have ever had. They do not hold back on the garlic and the bread is just chewy and delicious. Best 3 for $1.10 purchase you will make. Last night we tried your N.Y.Style pizza(large) & the awesome garlic notts. This was our first time trying the pizza stop,it won’t be our last, awesome great service! !